author of more than 55 books on folklore and storytelling. to life unique and fantastical tales of ancient Latin America. Oralia Garza de Cortés co-founder of the Pura Belpré Award, and 2012 recipient of the REFORMA Library Advocacy Award of the Joint Conference of Librarians of Color. We look forward to an enchanting night of stories! Noche de Cuentos website is launched, an effort conducted by REFORMA and the ALA Emerging Leaders Team N: Tina Chan, Johnice Dominick, and Alicia K. Long. A Noche de Cuentos event took place during the American Library Association’s Midwinter Meeting in Dallas, TX, on January 21, 2012. Read the Noche de Cuentos at Midwinter 2012 report. REFORMA’s Fourth National Conference (RNCIV) took place in Denver, CO, in September 15th – 18th, 2011. An amazing night of storytelling was presented for the occasion, including local storytellers from the Colorado area. The event was celebrated in conjunction with Hispanic Heritage Month. 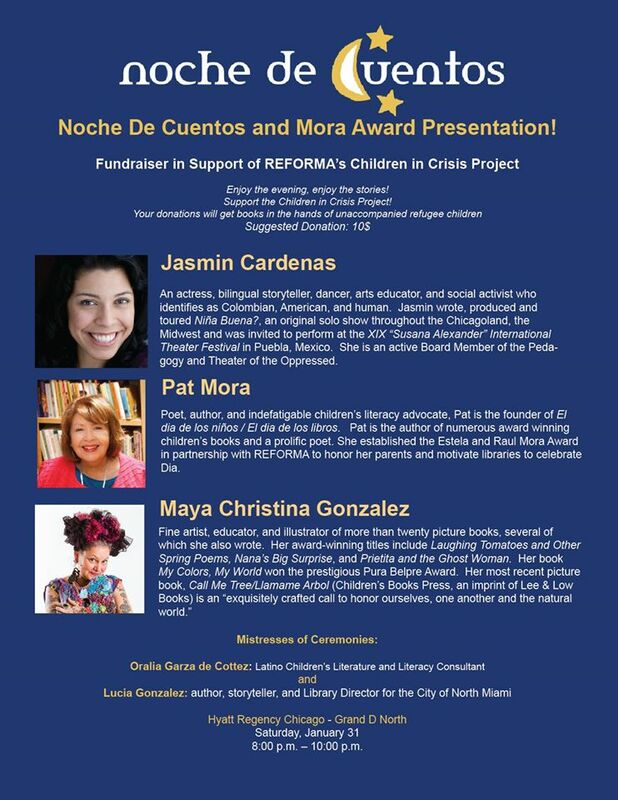 Read the Noche de Cuentos at REFORMA National Conference press release. Watch the videos of the REFORMA’s Noche de Cuentos in Denver. The American Library Association’s president, Dr. Camila Alire, launched the Family Focus Initiative. Read the press release for Family Literacy Initiative 2010. Read Dr. Alire’s interview on our history page. REFORMA launches Noche de Cuentos as response to the Family Focus Initiative. Lucia Gonzalez and Oralia Garza de Cortez, members of the Noche de Cuentos Task Force.